Ellen Altfest joins curator Jenny Moore in conversation. Altfest is a figurative painter whose intimately scaled works convey a distinct approach to realism and a sustained commitment to looking. Her painstaking depictions result in paintings that expand perception while exposing overlooked or under-appreciated aspects of her subject matter. 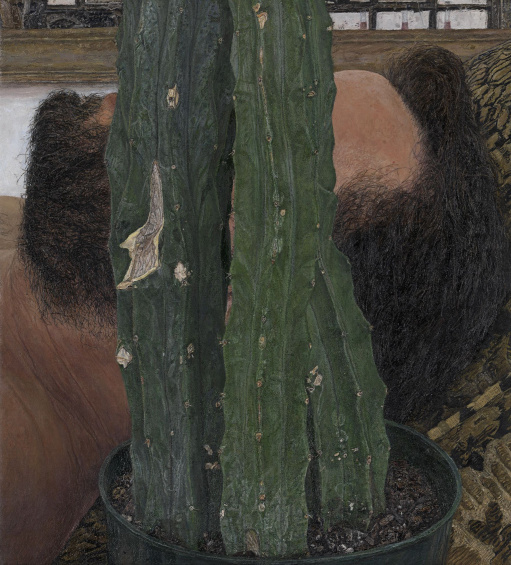 Painting from life, over a long period of time, she chooses subjects ranging from plants, rocks, logs, and gourds to a more recent fascination with the male figure. The exhibition at the New Museum will present a group of works from this latest series. Ellen Altfest was born in 1970 in New York City. She received her MFA from Yale University and attended Skowhegan School of Painting and Sculpture in 2002. She has been awarded residencies at the Chinati Foundation, Marfa, Texas, where she presented a solo exhibition, and the Dorland Mountain Art Colony, Temecula, California. Her work was included in “USA Today” at the Royal Academy of Arts, London, the National Academy Museum’s Annual Exhibition in New York, and will be featured in “It is what it is. Or is it?” at the Contemporary Arts Museum Houston. She currently lives and works in New York City. “Ellen Altfest: Head and Plant” is curated by Jenny Moore, Assistant Curator. “Ellen Altfest: Head and Plant” is made possible through the support of the American Chai Trust. Additional support is provided by the Toby Devan Lewis Emerging Artists Exhibitions Fund, and the Producers Council of the New Museum.